On February 9, 2013, the Kent State Truth Tribunal and Allison’s family submitted a list of issues to be considered by the United Nations, including Kent State questions to be asked at the United States’ Report on their Compliance with the International Covenant on Civil and Political Rights before the 107th Session of the Human Rights Committee in Geneva, March 11-28, 2013. 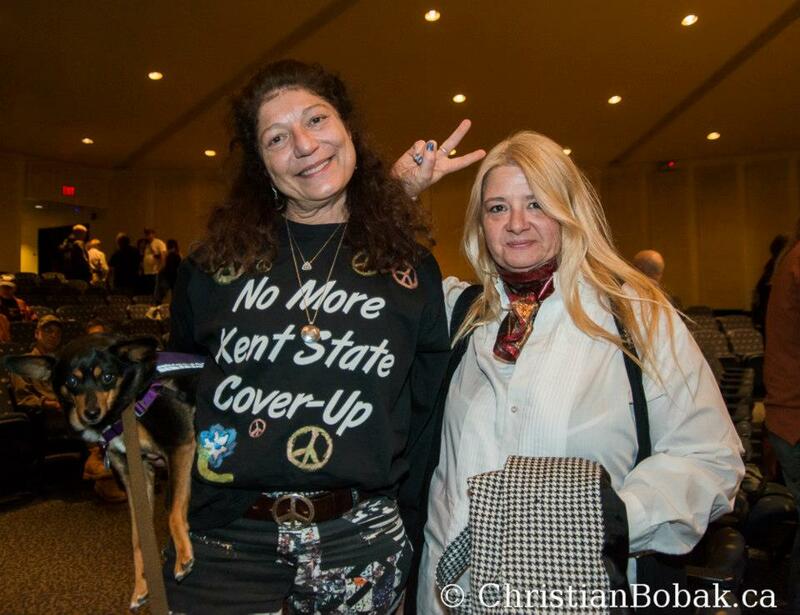 The Kent State Truth Tribunal (KSTT) was founded in 2010 upon the emergence of new forensic evidence regarding the May 4, 1970 Kent State Massacre. KSTT is a non-profit organization focused on revealing truth and bringing justice to Kent State massacre victims and survivors. Representing Allison Beth Krause, 19-year-old student protester slain at Kent State University on May 4, 1970: Doris L. Krause, mother & Laurel Krause, sister. On May 4, l970 members of the Ohio National Guard fired between 61 and 67 shots into a crowd of unarmed anti-war protestors at Kent State University in Kent, Ohio, killing four and wounding nine students. For over 40 years, the government has claimed that the Guardsmen did not fire on command, and instead shot in self-defense after hearing sniper fire in the crowd. In 2010, new forensic evidence emerged debunking this theory. The evidence consisted of a tape recorded by a Kent State student during the shooting. Though the original tape, known as the Kent State Strubbe tape, was destroyed by the Federal Bureau of Investigation (F.B.I.) in 1979, a bonafide copy of the tape was located in 2007 and was analyzed in 2010 by an internationally accredited forensic expert. The analysis, derived using state-of-the-art technology that was not available in prior investigations of the shooting, demonstrates that there was a ‘command to fire’ at the protestors. Moreover, the enhanced tape identified four pistol shots fired 70 seconds before the command as coming from an F.B.I. informant’s pistol to create the ‘sound of sniper fire.’ Although the U.S. Department of Justice (DOJ) received this new evidence, the Department declined to re-open its investigation of the Kent State shooting. The victims of the Kent State massacre and their families have been unable to obtain access to meaningful redress. In 1974, federal charges against eight members of the Ohio National Guard of willfully violating the rights of the dead and wounded students were dismissed because, according to the judge, the government had failed to prove its case. In 1979 a civil rights settlement was reached with the issuance of a signed Statement of Regret and $15,000 for Allison B. Krause, one of the victims of the Kent State shooting. However, the settlement did not include an apology. Moreover, the federal charges and settlement were centered on civil rights and constitutional violations – there has yet to be a criminal indictment for murder. Additionally, as investigations of the shooting have thus far only been conducted by government entities, there has yet to be a credible, impartial, and independent investigation of the Kent State shooting. Moreover, the U.S. military has failed to address the use of live ammunition on college campuses and whether appropriate force was used on protestors at Kent State. Failure to ensure justice and accountability for the Kent State massacre has set a precedent that the U.S. can continue to harass, abuse, and even kill protestors. Just ten days after the Kent State massacre, two student protesters were murdered by state police as they protested the Vietnam War on the Jackson State University campus. American authorities have stated ‘snipers’ prompted the firing of military weapons at student protesters, just as at Kent State University. Unfortunately suppression of peaceful assembly continues today. Since the ‘Occupy’ movement began in 2011, protestors have been labeled as ‘domestic terrorists’ by the F.B.I. and have been arrested in massive numbers for peaceful protests and assemblies. Until the U.S. conducts a credible, impartial and investigation into the Kent State shooting, and provides redress for victims and their families, protestors in the U.S. will continue to be at risk of being deprived of their fundamental rights without accountability. Although the U.S. has not addressed the Kent State shooting in its periodic reports to the Human Rights Committee, it has professed support for the right to remedy, compensation for victims of crimes, and the obligation to conduct independent, credible, and thorough investigations into violations of rights, especially the right to life. On the international stage the U.S. has called upon nations to uphold the rule of law and respect the right to peaceful assembly. This was particularly evident during the ‘Arab Spring,’ as the Obama Administration called for accountability when government officials suppressed speech and killed and injured protestors. What the Administration has preached abroad, however, is not always practiced at home. 1. Given the new forensic evidence emerging in 2010 related to the murders at Kent State, for what reasons has U.S. Department of Justice chosen to refuse to conduct a new, independent, impartial inquiry into the killings? 2. What lessons have American leadership learned from the May 4th Kent State Massacre? Under what circumstances will deadly, lethal force and war-grade weapons be used against peaceful American protesters, including on university and college campuses? 3. What steps will the U.S. government take to ensure that protestors are allowed to protest and assemble freely, without fear of intimidation, arrest, physical injury or – more seriously – murder? 4. Will the United States conduct an impartial, independent examination of the Kent State massacre? 5. What steps will the U.S. government take to ensure that the F.B.I. does not violate the fundamental rights of protestors, including the right to life? 1. Conduct a full, independent and credible investigation into the May 4th shooting and killing of 13 American protesters at Kent State University. Such an investigation must consider the new evidence and ensure that victims and their families have the right to be heard and given an opportunity to present evidence and testimony. 2. The U.S. government must ensure that all incidents involving the killing, injuring or unlawful use of lethal force against protesters are promptly and impartially investigated, the perpetrators held accountable, and the victims and their families are provided with adequate information on the investigation and full redress. This should include a criminal investigation and prosecution of perpetrators in addition to other legal remedies for violations of civil and constitutional rights.